Southern slow cooked green beans, or snaps, are an institution. Most are done with fat back or salted pork. I wanted to make a vegan/vegetarian version that could hold up. These are packed with flavor and are a great side dish or can be a meal if served with roasted or boiled baby potatoes. 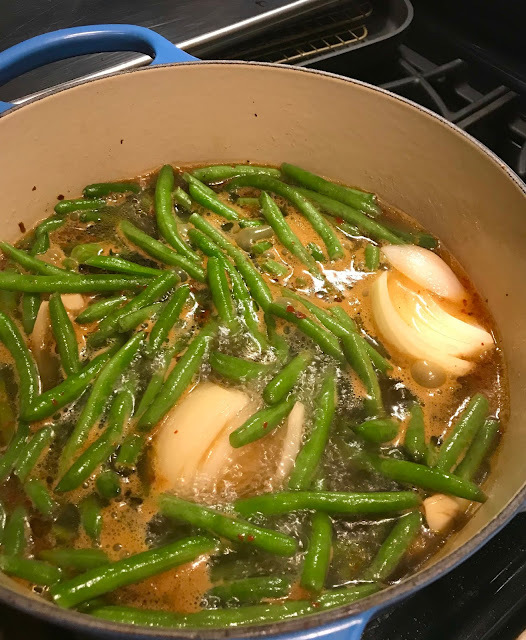 If you like southern style green beans, give this a shot. 2 lbs Green Beans, cleaned. 1/2 Onion, peeled, left whole or sliced in half. Put all the ingredients into a heavy pot and bring to a boil. Reduce to a lazy simmer. Keep the cover slightly ajar. Cook for at least one hour, but two is better. Regarding the onions, they literally melt, so you don't need to fish them out.